As the repeal of the Affordable Care Act begins to look ever more likely, the question on many people’s minds is just what sort of program Republicans will offer in its place. Though millions fear being left in the lurch, just today, Senate Majority Leader Mitch McConnell proposed an innovative new approach to healthcare: his proprietary, at-home workout routine guaranteed to target all the major core muscles in just 20 minutes a day. Amazing. Senator McConnell has certainly shown he’s serious about healthcare. Wow. Instead of getting bogged down in overly complex issues like high insurance premiums and pre-existing conditions, McConnell urged the American people to call their senators now in support of his program, called McConnell Blast 20, which would send a complete pack of eight insane stomach-sculpting DVDs to every eligible household in America. The senate majority leader then invited the assembled media to slap his rock-hard stomach if they wanted to feel the results for themselves. Whether or not you want Obamacare to be repealed, it’s encouraging to hear that Republicans are dutifully at work coming up with their own solutions to keeping Americans healthy. 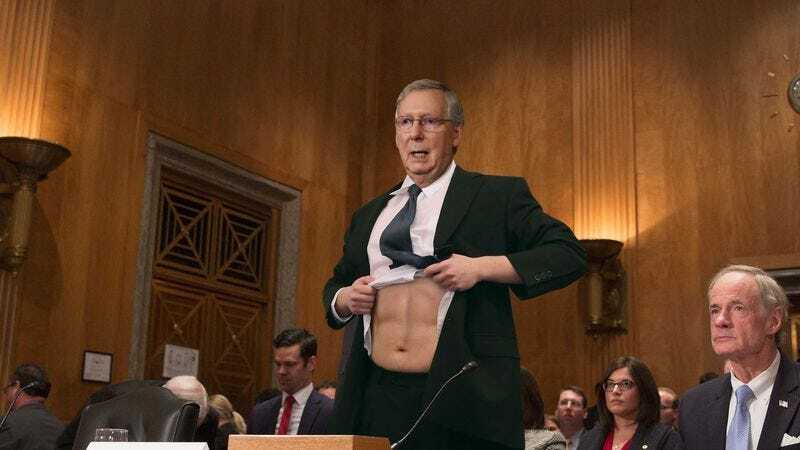 And from the looks of Mitch McConnell’s totally shredded abs, this program should be pretty tough to top.